The more things change, the more they stay the same. This proverb aptly describes the unchanged media environment in the Kingdom of Swaziland. Nothing has changed in the seven years since the adoption of a new Constitution in 2005. Section 24 of the Constitution guarantees freedom of expression, including freedom of the press and other media, yet in reality this freedom remains largely theoretical. The three seats of power — government, big business, and media owners — continue to violate the constitutional rights of citizens to freedom of expression. In defiance of the kingdom’s supreme law, they maintain a stranglehold on the media. On top of the 32 restrictive media laws, plus the draconian Suppression of Terrorism Act of 2008, the government has invoked the Public Service Announcement (PSA) guidelines to further suppress dissenting voices in the state broadcast media. 2012 saw but one promising media development. The Ministry of Information, Communication and Technology (ICT) finally tabled the Swaziland Communications Bill of 2010 in Parliament since the signing of the controversial Joint Venture Agreement (JVA) between the Swaziland Posts and Telecommunications (SPTC) and Swazi MTN Limited fourteen (14) years ago. This Bill seeks to liberalise the airwaves and introduce an independent regulatory regime in the state-controlled communications industry. In the year under review, the Constitution faced its most telling test. Attorney General Majeh’enkhaba Dlamini, acting on instruction from the Chief Justice, opened a case of contempt of court against The Nation magazine after it ran a story calling on judges to inject a dose of judicial activism into the justice system, in line with the constitution. The Nation, published monthly, calls for entrenching a culture of constitutionalism and democracy in Swaziland, an absolute monarchy hiding in the clothes of constitutional democracy. The Attorney General, however, revealed that Swaziland is not yet ready for true democracy, and it is the prerogative of the executive (and therefore not the judiciary) to entrench a culture that respects the legal system. The print media also felt a few shocks in 2012, as newspaper owners increasingly tried to ingratiate themselves with the ruling elite. The Swazi Observer, a royalist newspaper, purged its editor–in-chief who dared to give column space to several progressive groups. The daily paper, which many rightly view as a pure propaganda machine for the royal family, also suspended two editors for not adhering to its ‘original’ mandate. On the other hand, the Times of Swaziland’s publisher has allowed commercial interests to take precedence over editorial independence. After his managing editor jumped ship to join the Swazi Observer, he recalled his former managing editor — now beholden to the higher authorities — from the Prime Minister’s Office, where he served as Head of Secretariat for the SMART Partnership Office. Left in this exposed state, the print media are easily manipulated by the ruling elite. Interference, censorship, assault, harassment and intimidation are all common. 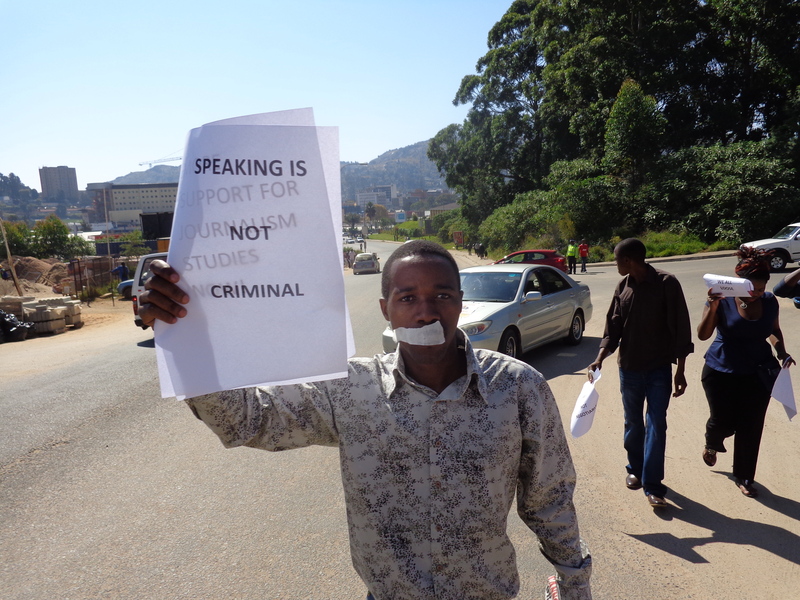 In short, Swazi citizens are being denied their right to freedom of expression and information, thanks largely to the symbiotic relationship between government, business and media owners. Struggling from the global economic meltdown as well as severe internal financial troubles, Swaziland has seen only one new entrant into the media industry. In August 2012, Blankly Investments (Pty) Ltd started a monthly magazine called Agribusiness. Endorsed by the Ministry of Agriculture and the farming community at large, it specialises in agriculture news. It has joined another periodical, The Nation, which focuses mainly on socio-economic and political issues. Published by the Swaziland Independent Publishers (Pty) Ltd, it remains the pulse of the country’s news analysis. The Times of Swaziland Group of Newspapers and Observer Group of Newspapers remain the two dominant players in the newspaper industry. The former publishes the Times of Swaziland, Swazi News and Times of Swaziland Sunday. The latter publishes Swazi Observer and Weekend Observer. There are also two weekly tabloids namely the Swazi Mirror and Ingwazi News. As fairly new entrants, these tabloids are struggling to attract advertising. The same applies to the broadsheet Business Sunday. Their future looks bleak, as they are unable to generate advertising revenue — the lifeblood of any newspaper. Little has changed in the broadcast media. The Swaziland Broadcasting and Information Services (SBIS), which controls radio, and Swaziland Television Broadcasting Corporation (STBC), television, remain the two dominant players — the two only players, really. They operate with public funds, yet they remain state broadcasters instead of public service broadcasters. Government has invoked Public Service Announcement (PSA) guidelines to prevent citizens from airing their views via these state broadcasters. There is one other radio station, the Voice of the Church (VOC), airing mostly religious programmes. And there is a private television station, Channel Swazi, which is on and off air due to financial challenges. Neither of these independent broadcasters dare to question the country’s ruling elite or report on them in anything but positive terms. In optimistic and laudable readiness for the passage of the Swaziland Communications Bill of 2010, which might free up the airwaves, the unlicensed community radio stations have formed a Community Radio Network to speak with one voice. They are the Lubombo Community Radio, Matsanjeni Community Radio and Ngwempisi Community Radio. Swaziland does not have an Access to Information Law. Naturally, this curtails the free flow of information. When the media, whose raison d’être is to disseminate information, requests information from either government or business; it finds itself shoved from pillar to post. Even the popular monthly breakfast media briefings organised by the public and private sector have not helped the situation. Industry captains and senior government officials simply use them to share selective information with the media practitioners. A good example being an apology demanded by Martin Dlamini, governor of the Central Bank of Swaziland, from the media after a one and half days media briefing with all the editors from the media meetings. Appointment of a government spokesperson and other information officers has not solved the problem of access to information. Access to public information in the ministries remains the media’s biggest challenge. In practice, nothing can be done by the information officers because only the ministers are mandated to release information to the media. What’s more, Cabinet issued a directive not to release information to blacklisted media houses. According to the Ministry of Health spokesperson, the minister has blacklisted The Nation. The Swaziland Water Services Corporation (SWSC), a public company, echoed these words. Threats to withdraw advertising are a common strategy used by government to silence the critical media. At the core of this issue is a fundamental misunderstanding of the role of the media and the right of that media to access and the citizens’ right to know public information. Government has tightened its grip on the once uncompromising print media. In January 2012, Minister of Information, Communication and Technology (ICT), Winnie Magagula, held an impromptu meeting with all editors where she told them they must positively report the visit of Equatorial Guinean President, Teodora Obiang Nguema Mbasago. The newspapers heeded her directive: all the media houses waxed lyrical about the expected socio-economic benefits to be reaped from a questionable oil deal. The editors suppressed President Mbasago’s negative stories of graft and repression that were run by the international media. In fact, the Swazi Observer was forced to apologise for a cable news item published by SAPA that negatively exposed the President. For a contempt of court charge laid in November 2009, The Nation finally had its day in court in February 2012. This landmark case tests Swaziland’s commitment to its Constitution. The Attorney General (AG) has told the court that Swaziland is not yet ready for democratic values enjoyed in the civilised world. The magazine has called for High Court judges to take part in entrenching a culture of constitutionalism in Swaziland. The Chief Justice has found that invitation contemptuous of the court. Many months later, the judge has not made a court decision on this landmark case, which will test the constitutional right to media freedom. On celebrating World Press Freedom Day on May 3, Swaziland Editors’ Forum (SEF) member, Mbongeni Mbingo, then managing editor of the Times of Swaziland, betrayed the cosy relationship that already exists among media managers, government and business. He declared: “I agree with the notion that media freedom is fragile. In fact, I can almost say that it is a fallacy and can hardly be achieved.” Mbingo questioned the constitutional rights of the “political activists” to press freedom. He blasted “a sector of people with their own agendas,” questioning their right to press freedom. This was indicative of the much bigger twin problem of censorship and self-censorship. In February, the Observer Group of Newspapers, owned by the Tibiyo Taka Ngwane, a royal conglomerate, experienced a major shake-up to its management team. 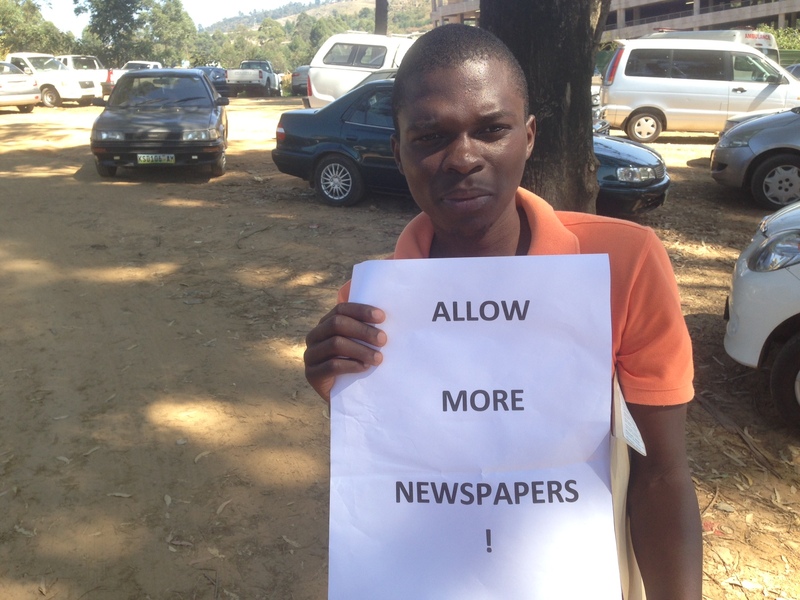 Swazi Observer editor-in-chief Musa Ndlangamandla was fired. His sin, amongst others, was that in his column Asikhulume he featured leaders of the proscribed People’s United Democratic Movement (PUDEMO) and other civil society representatives calling for political change. Later, mid-year, without consulting the Swazi Observer Board, newly appointed managing director Alpheous Nxumalo also suspended editor of the daily Thulani Thwala and editor of the weekly Alec Lushaba. Both Thwala and Lushaba remain in limbo, pending investigation into their failure to follow the publication’s ‘original’ mandate. When Board members sought answers, the managing director made it clear that he is not answerable to them. 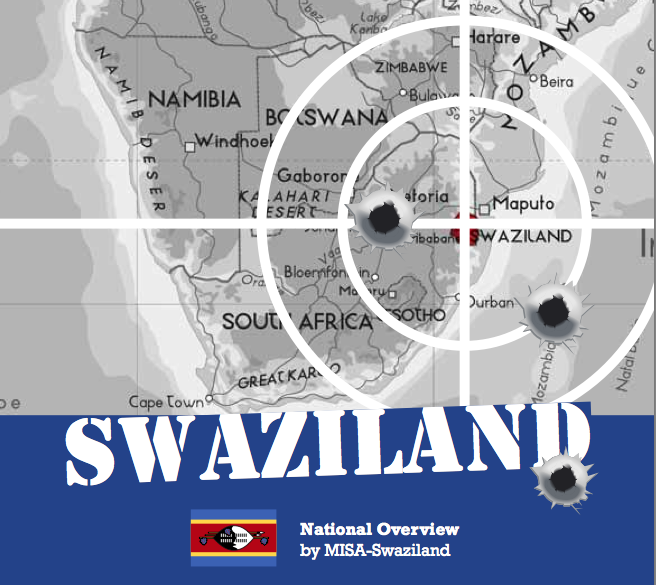 Nearly a year later, the Swazi Observer managing director has not finalised the investigation. The Swaziland Editors’ Forum (SEF) has done nothing about it. In fact, the MD is on record saying progressive voices or NGOs, whom he suspects of pushing an agenda for political change, will not be entertained by his newspaper, as long as he is in charge. Newsrooms in the print media are no longer a safe haven for journalists following their infiltration by spies. In August 2012, police interrogated one of the reporters at one of the print media houses after common and casual newsroom talk with his colleagues. According to a complaint lodged by the Swaziland Diaspora Platform (SDP) with the MISA Swaziland chapter, a journalist who was spying reported him to the police and on others in the newsroom. Journalists have begun to tread cautiously and carefully in the wake of police informants in the media houses. This heightened climate of fear perpetuates the already endemic self-censorship, which in turn bodes further ill for media freedom. The recall of Times of Swaziland managing editor, Martin Dlamini, from Government, has raised eyebrows within the discerning civil society and media fraternity. As someone now allegedly beholden to higher authorities, there is fear that the newspaper editorial independence is at stake. This fear has been exacerbated by his unprecedented coverage of King Mswati III’s trip to the United Nations in New York, later in the United Arab Emirates in October 2012, where he not only reported for his own publication but also for the competing Swazi Observer! Dlamini undertook this trip as part of the king’s delegation. The mere fact that the Times of Swaziland managing editor, a leading private publication, is found writing stories for the Swazi Observer, a royalist publication, is cause for serious reflection. His position is untenable. How can he discharge his unbiased editorial duty when he would appear to be be- holden to the authorities? Taking their cue from leaders, members of the public have continued to attack and harass media practitioners in their line of duty. The 2012 victims were a reporter and photojournalist from the Times of Swaziland Group of Newspapers. Four men at eNkhaba area attacked Swazi News journalist, Sabelo Masimula, when he tried to balance a story of a widow who ran away when her in-laws tried to forcefully remove her weeds. A colleague Walter Dlamini, a Times of Swaziland Sunday photojournalist, was also attacked by seven members of the uniformed forces after taking a picture of an asthmatic maiden who had collapsed at the Reed Dance at Mbangweni Royal Residence. They forced him to delete the pictures. 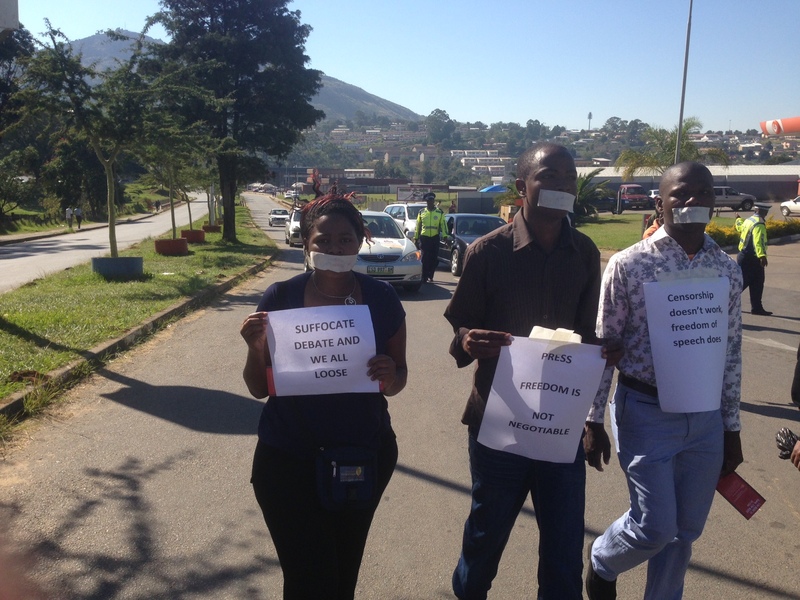 Unbridled censorship remains a concern within the state broadcasters, namely, the Swaziland Broadcasting and Information Services (SBIS) and Swaziland Television Broadcasting Corporation (STBC). Government has banned reporting on the activities of the labour unions, including strikes and announcements, in the state broadcasters. 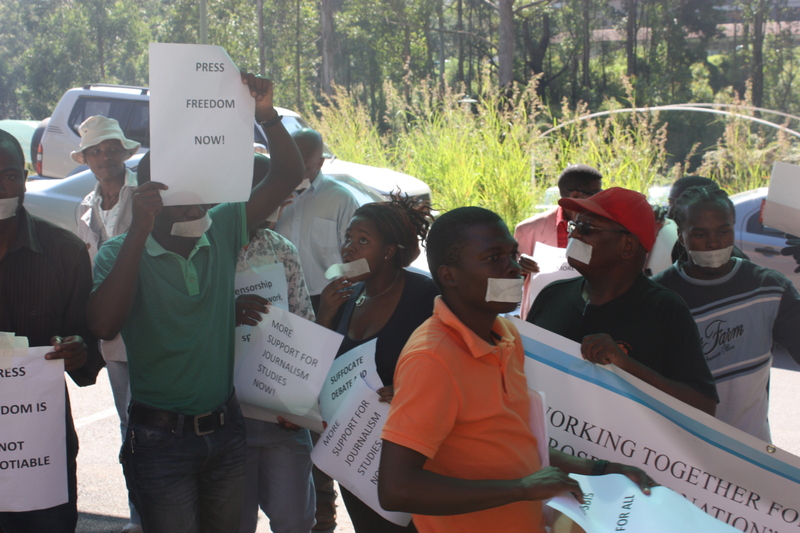 Affiliates of the Trade Unions Congress of Swaziland (TUCOSWA), the Swaziland National Association of Teachers (SNAT), reacted by kicking out Swazi TV reporters from their meetings accusing them of negative reporting or total news blackout. Union leaders were not the only ones affected. ICT minister Winnie Magagula has extended the ban to all Swazi people irrespective of their status in society. She has invoked the Public Service An- nouncement (PSA) guidelines, which prevents citizens from airing their opinions on the radio and television stations. They have to clear their views or opinions with their chiefs before they can be aired on the broadcast media. Setting an example, both Swazi TV and Swazi Radio pulled off air a national announcement made by Acting Governor of Ludzidzini Royal Residence, Timothy Velabo Mtetwa. Hot on the heels was the stoppage of a popular Swazi TV talk- show, Makhelwane Umbona Ngetento, hosted by gospel artist Mduduzi Simelane. In addition, the minister issued a warning to prevent parliamentarians and ministers from making statements or announcements in the broadcast media that could be construed as campaigns. Banning citizens from speaking freely on the state broadcaster has demonstrated an urgent need to transform the state broadcaster into the public service broadcaster. Swazi TV suspended acting assistant news editor, Vusi Gamedze, and avid editor, Earnest Mabaso for allowing a foreign newsstory into the bulletin that ‘misrepresented the annual Reed Dance ceremony’. A protracted legal battle between Swaziland’s telecommunications giants, Swaziland Posts and Telecommunications Corporation (SPTC) and Swazi MTN Limited, has proven costly for consumers. About 64 000 consumers were deprived of an alternative affordable telecommunications service. The bone of contention was a Joint Venture Agreement (JVA) breached by SPTC when introducing new products, ‘One mobile phones’ and ‘Wireless Fixedfones’, into the market. Swazi MTN enjoys exclusive rights to operate a mobile network, thus they argued that SPTC had breached the JVA. The International Court of Arbitration (ICA) ruled in MTN’s favour and ordered the public company to withdraw its affordable products. Technicalities aside, the SPTC/MTN saga revolved around nothing but a conflict of interest. With its affordable products, SPTC gave Swazi MTN stiff competition. MTN’s powerful shareholders, namely King Mswati III and Prime Minister Sibusiso Barnabas Dlamini, were supposedly torn between the national interest and their own self-interests. The Swazi MTN shareholding structure has SPTC holding 41%, Swaziland Empowerment Limited, a consortium, 19%, MTN International, 30%, and King Mswati III, 10%. Princess Sikhanyiso was appointed to the Swazi MTN Board to manage the royal shares. In a country where the mainstream media is highly censored, the new media and social media are now considered as an alternative platform for the free flow of information. A growing number of Swazis, especially the youth, use the social media as the most convenient means of communication. It enables them to enjoy their constitutional right to freedom of expression. They post all sorts of information, including at times seditious information, which has led incensed legislators to call for the censorship of the internet. They have asked the head of government to find ways to censor the internet. However, the prime minister – who is also minister responsible for the police – has repeatedly told parliamentarians that it is extremely difficult to censor the internet. Their information banned or censored by both the private and state media, civil society groups have taken advantage of the new or social media. They mobilise people by sending text messages, tweets or Facebook updates. The Swaziland National Association of Teachers (SNAT), for example, used social media to mobilise their members during the three-month long teachers strike. The censored media, especially the newspapers, ran stories that were sourced from Facebook. Though social media is not widely used at the moment, it is undoubtedly gaining pace. In many regards, the new forms of media (text messages, Twitter, Facebook, YouTube, WhatsApp, etc.) have allowed citizens of Swaziland to put into practice their constitutional right to freedom of expression and media freedom. 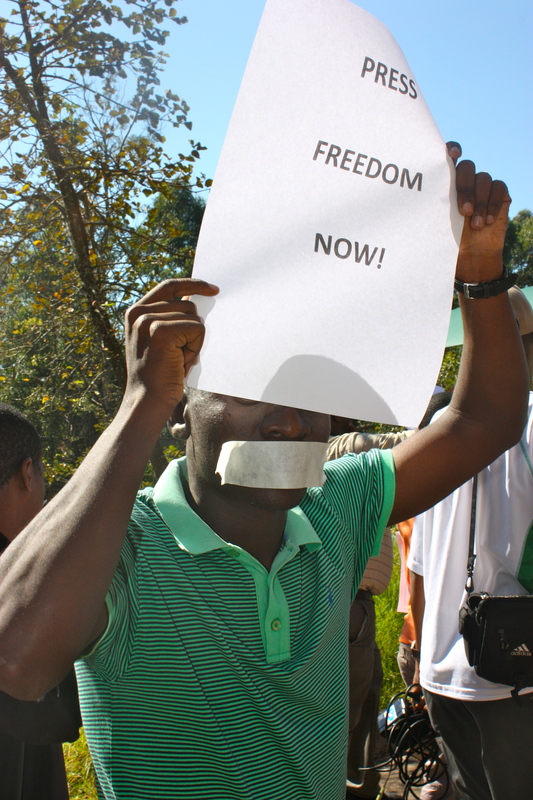 To achieve greater freedom of expression, and by association media freedom, Swaziland’s media institutions – MISA-Swaziland, Swaziland Editors’ Forum and Swaziland National Association of Journalists (SNAJ) – must speak in a strong and united voice. This is not to say we all must agree. Rather, the media must first acknowledge and accept that freedom of speech goes both ways: the right to question and the right to be questioned; the right to criticise and the right to be criticised. And also to accept that freedom of speech is for everyone: citizens, business people, parliamentarians, cabinet members, civil society leaders, public servants, journalists – the list goes forever on. Moreover, it is worth keeping in mind that a tool is only good as the person using it. There is, therefore, an urgent need to equip journalists with professional skills. This way, they will be able to manoeuvre, survive, and prosper in this difficult media environment, an environment that might be likened to a minefield. Training will help them understand and appreciate the parameters of media freedom – underpinned by the notion of the public interest. Abiding by the Swaziland Journalists Code of Ethics and the Constitution cannot be overemphasised. Yet the continued violation of the code of ethics and the Constitution by the Swazi media is as good as giving ammunition to those who wish to further curtail media freedom. MISA acknowledges the grave conditions that journalists work in, yet there is still a lot to be said for taking personal responsibility. The Swazi media, if it is serious about freedom of speech, must look itself in the mirror while simultaneously demanding more freedom for all citizens. As a united force – that thrives on healthy and honest debate – the media must steadfastly argue for the repeal of the 32 restrictive media laws. They should do so by lobbying the soon-to-be-elected 2013 parliamentarians. Until journalists themselves argue for meaningful law reform, freedom of expression and media freedom in Swaziland will remain a mirage. This article is an extract from So This Is Democracy?, the Media Institute of Southern Africa’s annual publication on the state of media in the region. Click here to find out what’s happening in other countries — download the files at the bottom of the new page. Tags: access to inforamtion, africa, censorship, freedom of speech, legislation, media, media institute of southern africa, MISA, So This Is Democracy?, southern africa, swaziland. Bookmark the permalink.